When the Christmas clock is ticking, get ahead of the countdown with these 12 festive tips! Halloween, then Thanksgiving… You’ve got plenty of time before Christmas, right? December 1st, 2nd… 18th… What?! When did this happen? How did you get here, the big day right around the corner, with no tree, no lights, no stockings hung up by the chimney with care? Take a deep breath and relax. It’s not too late to put up Christmas decorations. Shopping, cleaning, baking, and visiting keep us all hopping during the holidays. If you haven’t gotten to decking the halls, check out these twelve easy, last minute Christmas decorating ideas. You’ll be surprised how much holiday cheer you can rustle up with minimal effort, no tree required. Plus, the later you get started, the more likely you are to find Christmas decorations on sale! Shared meals are central to the holidays, and Christmas is no exception. 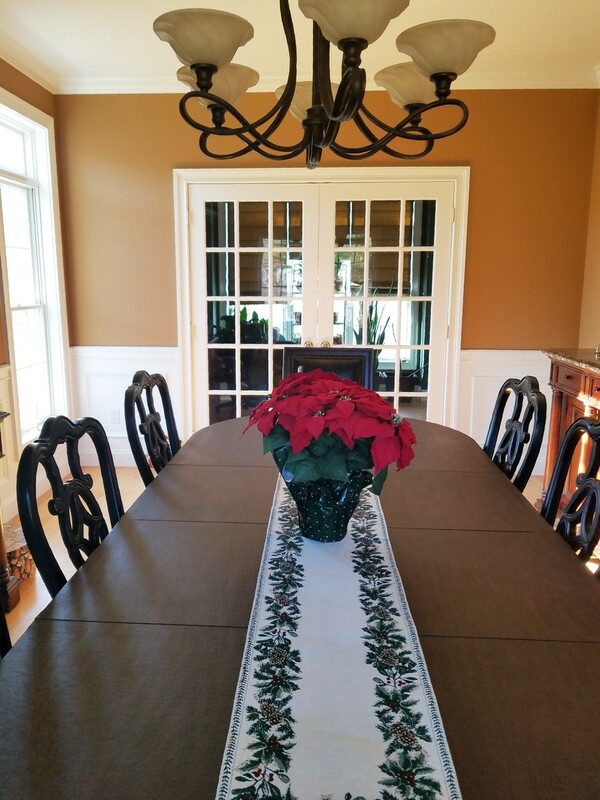 Bring some festivity to the table with a decorative runner, placemats, and/or napkins. Whether you favor a low key holly theme or go full on Santa style, your guests will get their jolly on at dinner. Looking for a Christmas centerpiece? Poinsettias are inexpensive and available all over the place, so get on board that sleigh. You can decorate your own, or buy one ready to go with all the trimmings. 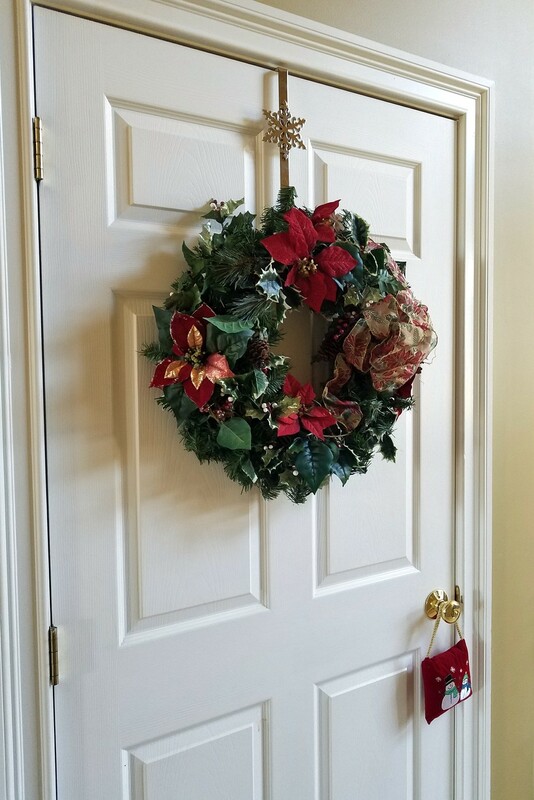 Hanging a wreath on your front door is a sign of holiday welcome, and puts everyone in the spirit. Try indoor wreaths, too. You can forgo the trouble of a tree, but still enjoy the seasonal scent of pine if you choose a fresh one. 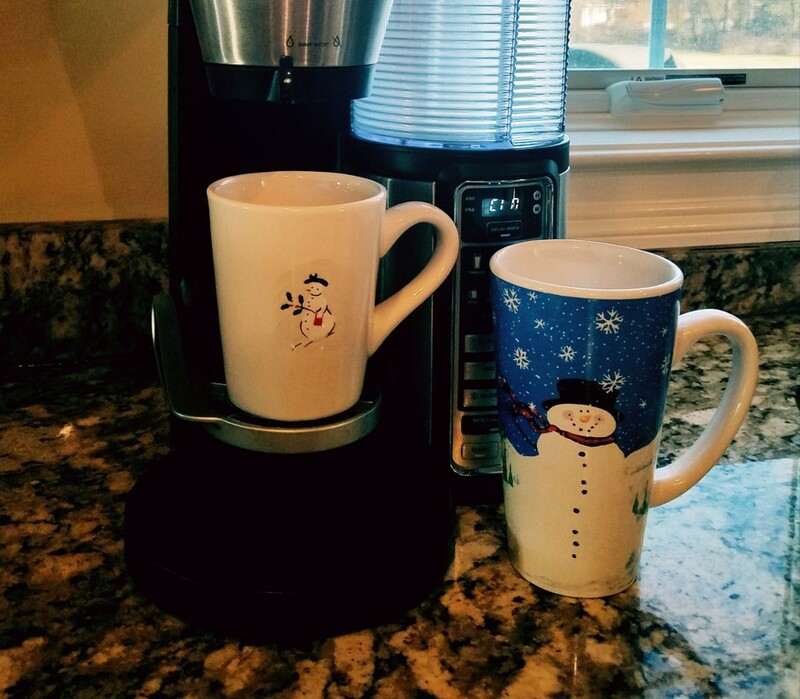 A cup of cheer tastes more like Christmas from a holiday mug, doesn’t it? And who doesn’t have one or two—maybe from the Secret Santa office party, or a generic gift from your great aunt. It’s time to break those babies out, along with whatever cookie plates and candy dishes you have for the season. If your cabinet looks like the Grinch stocked it, stop in at virtually any store and treat yourself to at least one holiday mug. And hey, why not add some hot chocolate? Whatever holiday pattern you fancy, welcome mats have got you covered. Happy Holidays, Merry Christmas, reindeer, snowmen... Whatever yuletide joy you’re looking to spread, start it off with a good foot wiping at your front door. And don’t stop there. 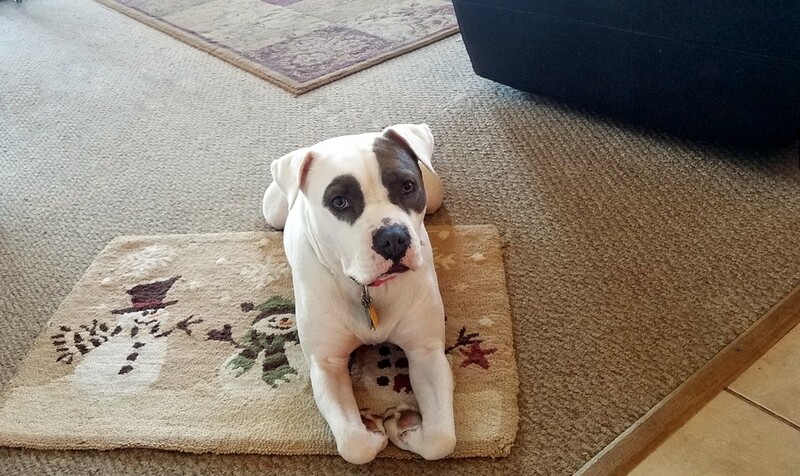 You can also use holiday floor mats as decorative accents around the house. Full disclaimer: You don’t need a mantel to hang stockings, and you don’t have to fill them. 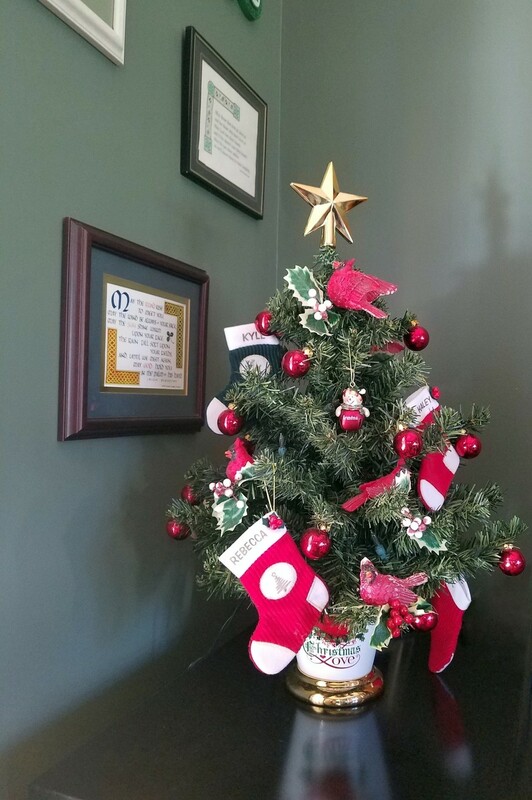 A colorful stocking or two on the wall or in a window is a fitting salute to the season, and one of the simplest forms of Christmas home décor. A finishing nail can support an empty stocking. Go with something heavier if you expect Santa to show. On a window, the locking lever can hold up whatever you’re planning. Extra candy canes, please! Inexpensive, useful, and available in about a thousand designs. 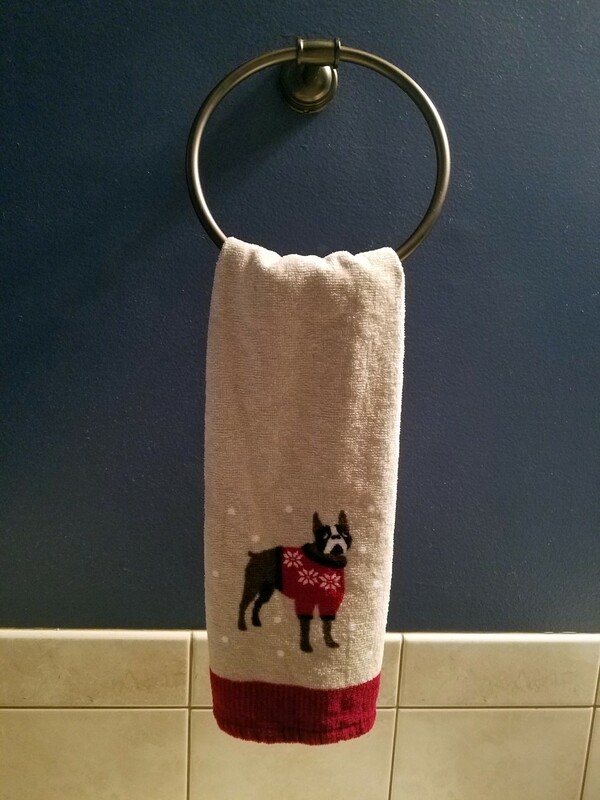 What’s not to love when it comes to holiday hand towels? Give your regulars the week off and put out something a little merrier. No hand towels in the bathroom? Get a package of the disposable kind for the season, or head for the kitchen and swap out your boring dish towel for a more jovial model. 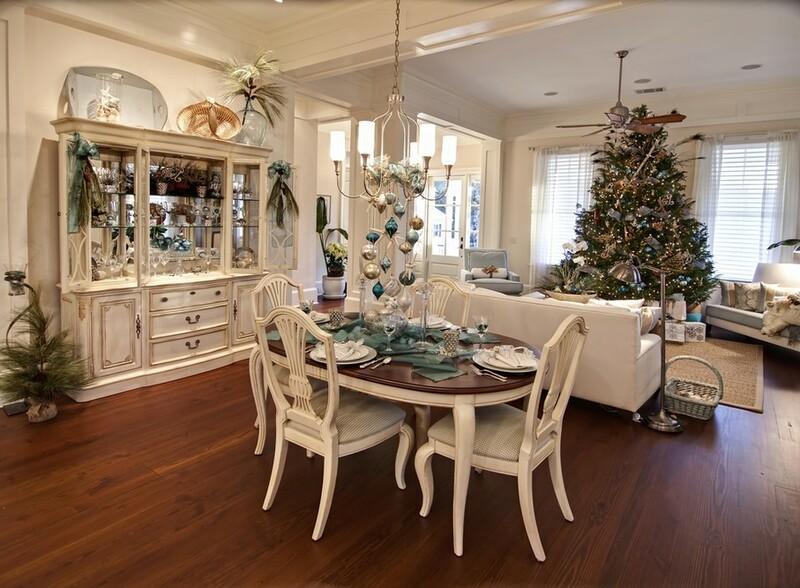 You absolutely, positively do not need a Christmas tree to hang ornaments. Get creative, and hang them on your curtain rods, or chandelier. Or throw hooks to the wind, and put them in a clear glass bowl or vase. This works particularly well with traditional glass globes. Fresh or artificial flowers and greenery are an easy and elegant holiday addition. 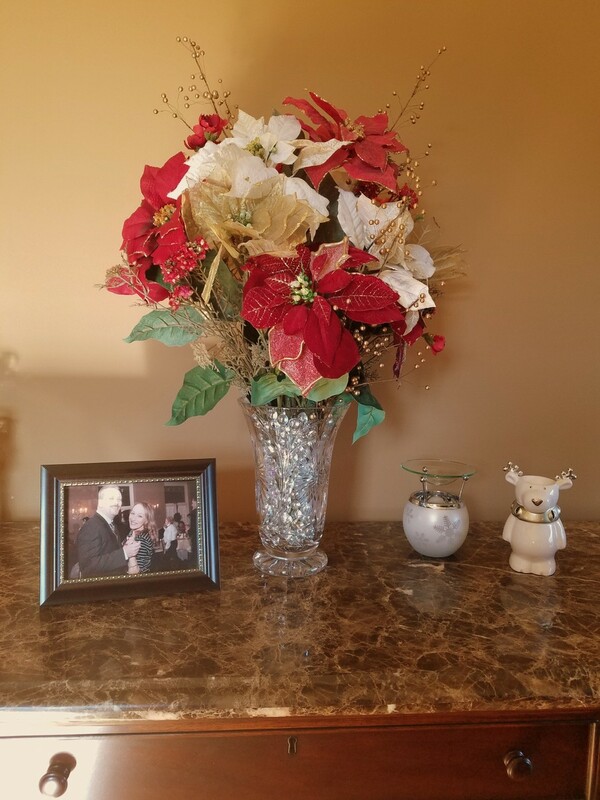 Red and green are beautifully complemented by either silver or gold, or you can go with a snowy white arrangement. Berries are a winter staple for floral arrangements in any color. Although fresh flowers tend to get pricey around Christmas, artificial ones are available for a song, and can be reused year after year. Santa eats cookies. You eat cookies. See where I’m going with this? 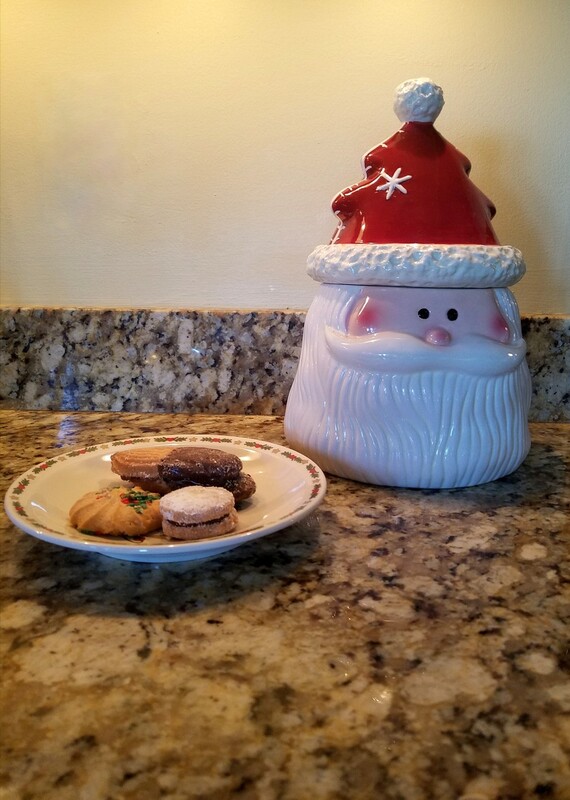 A holiday cookie jar will prove not only festive, but useful. Show your countertop a little love, and don’t forget the chocolate chips! Jingle bells, sleigh bells, silver bells. Whatever you want to call them, they’re the sound of Christmas, and their jolliness knows no bounds. 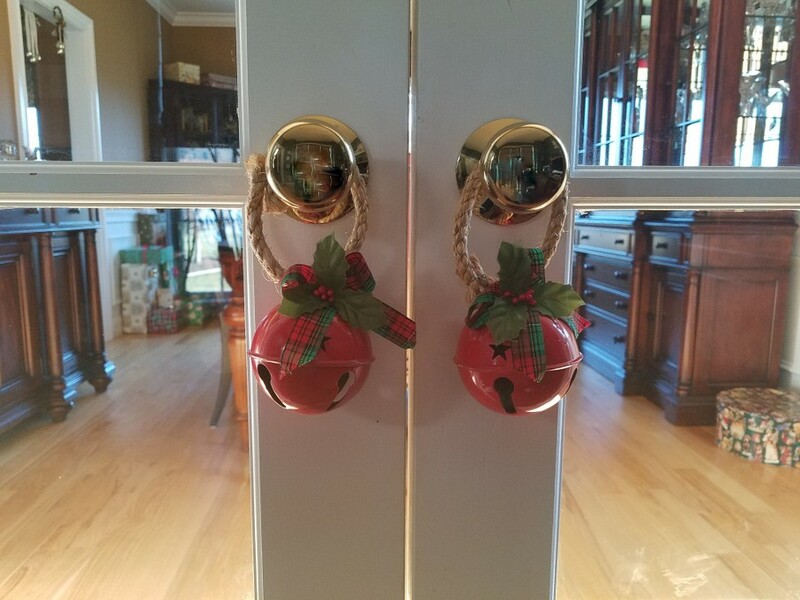 Hang them in doorways, drape them from doorknobs, and enjoy the tinkling effect. Warning: audio is multiplied tenfold no matter where you put them if you have cats. Nothing gets easier than decorating with holiday figurines. 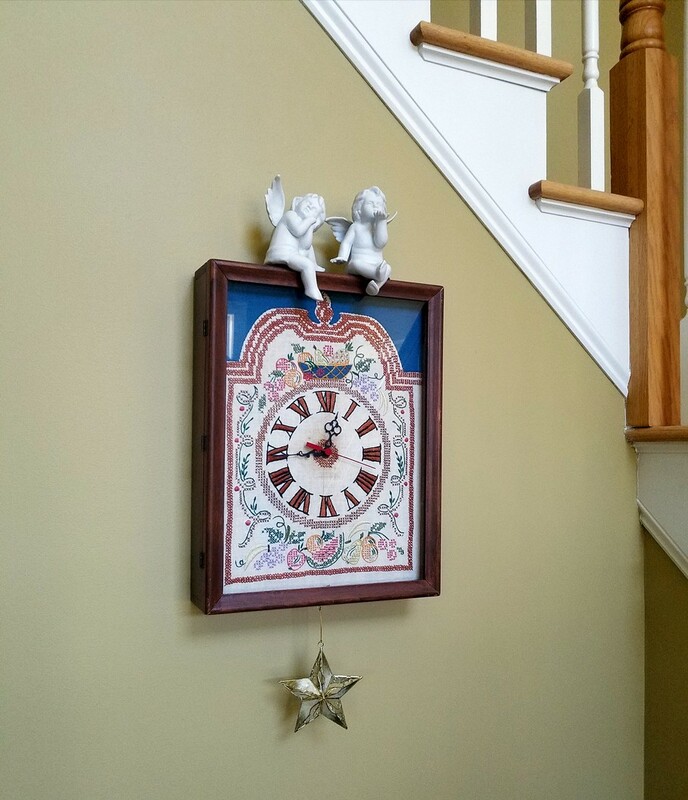 Put them on a shelf, table, or in this case, creatively perched atop an antique clock. Now you’re done. Not feeling the glad tidings yet? Try a few more Christmas figurines, and don’t forget to put on some carols to fa-la-la-la-la along with. It doesn’t have to be big, and it doesn’t have to be fresh. All your tree needs to be at this point is simple, so why not go for something table top that comes pre-decorated? Add a few personal ornaments, and you’ve achieved full size Christmas spirit in about 1/8 of the size. Even if it’s December 24th, it’s never too late for a little last minute decorating. Run with a few of these simple ideas, and remember, the twelve days of Christmas start on the 25th. So really, you’ve still got plenty of time to enjoy the season. Merry Christmas!